Last November, Google introduced four new metrics providing clearer information about the positions in search ads: Impr. (Absolute Top) %, Impr. (Top) %, Search (Absolute Top) IS and Search (Top) IS. It’s been anticipated that the analyzes and insights taken based on “Average Position” metric will lose its validity over time with the introduction of the metrics which the details will be mentioned below. What are the new Position Metrics? Search (Top) IS – The impressions you’ve received in the top location anywhere above the organic search results compared to the estimated number of impressions you were eligible to receive in the top location. Although the “Average Position” is a useful metric, it is insufficient to make clear conclusions with the position of the ads. For example; consider an ad with an average position of 1.5. As we know, there is no ranking such as 1.5 in the search results. This metric shows the position which the ad has received impressions compared to the other ads in the auction. Hence, it does not give a clear idea about the ranking of ad. In this case, the new position metrics bring a clearer picture of the ad position. The graph below shows a period in which the absolute top IS decreases although the average position is the same. In addition to this, for an ad with an average position of 3, it is considered that the ads are above the organic results in average, but sometimes one or two ads can take place above the organic results. 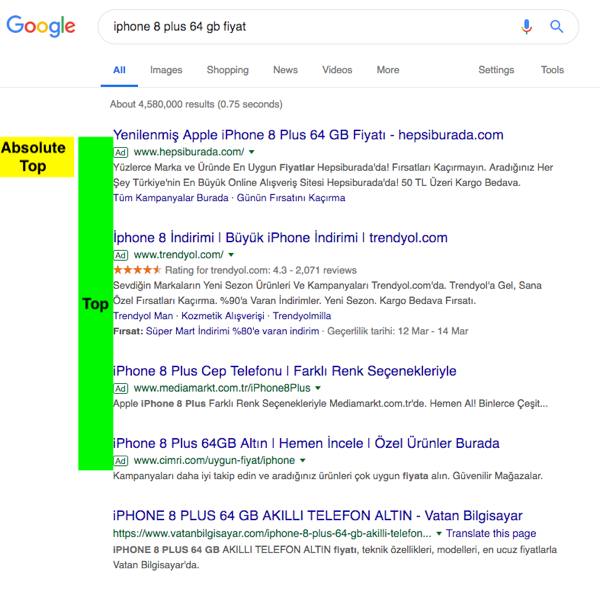 If there are two ads above the organic results, the ad with an average position of 3 will be displayed below the organic results. Thus, there is a significant difference between the second and the third ad position, and the ad is not as visible as it is considered. 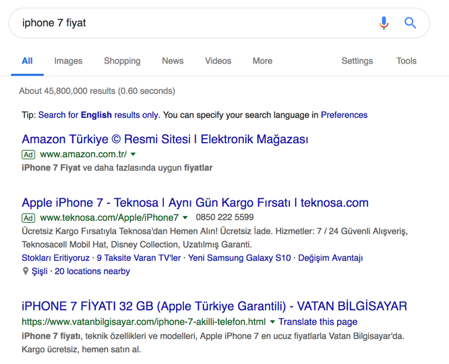 Sometimes, ads are not displayed above the organic results in the search results page. Although the ad’s average position is 1, the visibility lost arising from impression below the organic results may cause a decrease in the clickthrough rate (when other conditions affecting the clickthrough rate are considered as fixed). It is much easier to determine this situation with the new metrics. Impr. (Absolute Top) % and Impr. (Top) metrics clearly reveal what percentage of ad impressions will rank above the organic results and what percentage of ad impressions is shown on the top of search results. New metrics can be added at campaign, ad group and keyword level. Impr. (Absolute Top) % and Impr. (Top) % metrics even give useful information in the auction report. For example, although a competitor with an average position as low as 2.9 in the auction report does not appear as very important; with the Impr. (Absolute Top) % metric, it is seen that the competitor actually ranks on top of the search results with a 34%. Thus, it is possible to get clearer insights while shaping the competitor strategy. It is also possible to get insight on competition with the new metrics without looking at the auction insight report. 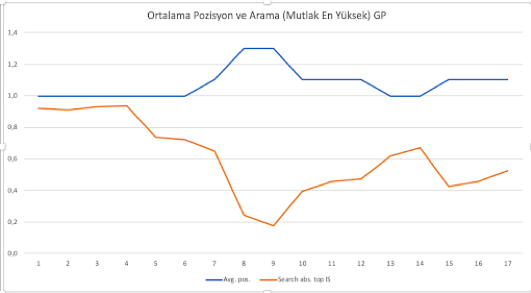 For example, if the average cost-per-click is increasing while Search (Top) IS and Search (Absolute Top) IS metrics are decreasing, then it is possible to tell that the competition increases. It becomes even more important to interpret these metrics in mobile ads where the screen is small and you need to scroll the page to see ads below the organic results. The relationship between the clickthrough rate and the Impr. (Top) % metrics of the two words that are under the same ad group and that have the same average position is seen very clearly. Of these two words with a same impression position, the first word’s highest impression share is 80% and the clickthrough rate is 14%. And for the second word, only 59% of the impressions are above the organic results and the clickthrough rate is 5.8%. Before the new metrics were introduced, unclear metrics with no obvious insight were being used while assessing the visibility and opportunities of the campaign. For example, while a campaign with an average position of 1.7 was considered to have a good visibility value; considering its IS (Impression Share), it’s seen that it gets only 58% of the eligible impressions. Search (Top) IS and Search (Absolute Top) IS metrics provide us with a more detailed picture of the ads. If a campaign strategy based on average position was used in this campaign, then the ads might not overlap with the advertiser’s objective, because it is displayed above the organic ads in 48% of the potential impressions and only in 11% of top of the search results page. Considering the cause of impression losses in more detail, it is seen that the impressions are mostly lost due to the ad rankings. In such a case, an optimization can be performed to increase the quality score and bid to strengthen the ad ranking. By using the new position metrics, ads can be optimized to increase the visibility in line with the advertiser’s objectives. 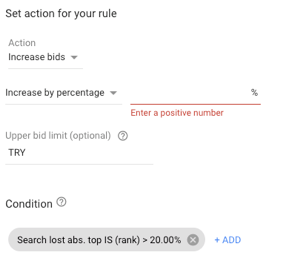 For an advertiser who sets visibility as the primary KPI, keywords losing impression due to ad ranking can be managed with an automatic rule as follows. The Impression Share metrics provide detailed information about the page position, while the Search Impression Share metrics show whether there is an opportunity to display the ads in a more relevant position. We can use the Search (Absolute Top) IS and Search (Top) IS metrics to evaluate the opportunity in the market while bidding according to the position on the search page. With Google’s recent announcement that it will soon remove the “Average Position” metric, the importance of new metrics that display ad positions in more detail further increases. The new position metrics provide clearer insights into the objectives of advertisers who particularly set visibility as the primary KPI, and will provide a clear guidance on the actions to be taken accordingly.